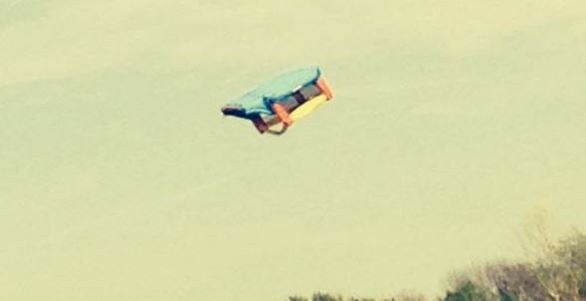 Bounce House Goes Airborne Injuring Children Onboard-Truth! - Truth or Fiction? Bounce House Goes Airborne Injuring Children Onboard-Truth! News reports of an accident involving 3 children playing in a bounce house that was swooped up 20 feet in the air by a freak dust devil. People are asking if this incident was true. Two boys from upstate New York were thrown from an inflatable bounce house after high winds caused it to break free of ground bindings and lifted it to a height of 20 feet on Monday afternoon. The boys fell out from height of about 15, were rushed to the hospital by responders, and were reported to be in stable condition. A 10 year old girl was also in the bounce house but managed to escape serious injury. She “suffered scrapes and a minor shoulder injury.” This according to a May 14, 2014 article, by NBC.